"We put in place our fiscal and monetary policies which focused on ensuring that we have discipline in our own budgetary management. We are very confident that this will bring additional impetus to the economy." In July 1997, the Independent State of Western Samoa officially dropped "Western" from the country's name, sharpening the contrast between its status as an independent nation and that of the U.S. Territory of American Samoa. 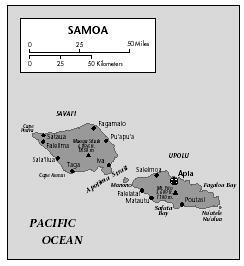 Samoa lies in the center of the South Pacific, between longitudes 171 and 176 degrees west, and latitudes 13 and 15 degrees south. Its closest neighbors are Tuvalu and Kiribati to the north, American Samoa to the east, Tonga to the south, and Fiji to the southwest. New Zealand, farther to the southwest, is the largest nation with which Samoa has historically maintained close economic, political, and social ties. Samoa comprises a chain of islands formed by volcanic action millions of years ago. The total land area is 2,860 sq km (1,104 sq mi). Only four of the islands are inhabited, but the nation also claims 120,000 sq km (46,332 sq mi) of ocean territory. The capital city of Apia is located on the island of Upolu, the second largest island and burial site of the writer Robert Louis Stevenson. Stevenson's former home, Vailima, has been renovated to serve as the official residence of the head of state. Samoa's population was estimated at 178,631 in 2002. An estimated 60,000 Samoans have moved to New Zealand. Others live in American Samoa and the United States, especially in Hawaii and California. The Samoan language is one of a large family of Polynesian languages and is one of the country's official tongues. The second official language is English. The ancestors of the present population arrived in the islands by voyaging from the west almost 3,000 years ago, before the original settlers of Tahiti, New Zealand, or Hawaii. Almost 93% of the people living in Samoa today are of pure Polynesian ancestry; the remainder are of European or combined descent. Samoa is a profoundly religious nation, as demonstrated by its motto Fa'avae I le Atua Samoa (Samoa is founded on God). Missionaries were active in the 19th century, and even today church schools are an important part of the educational system. Approximately half of the population is affiliated with the London Missionary Society. Samoa's economy is primarily agricultural and has suffered in the 1990s from a series of natural disasters. Three successive cyclones in 1989, 1990, and 1991 not only destroyed coconut plantations but also devastated roads and communications. These storms were followed in 1993 by a leaf blight that severely damaged a basic food crop, taro. Since then, agricultural production (but not taro) has begun to recover. Tourism was also disrupted by the storms but has great potential for economic development. The country is burdened, however, by high levels of external debt. Most of this is owed to the Asian Development Bank. The budget is heavily dependent on foreign aid. The gross domestic product (GDP) of Samoa was estimated at US $618 million in 2001, with an estimated per capita GDP of US $3,500. An important source of income is the money that is sent home by Samoans living abroad. The Samoan unit of currency is the tala .